Swear 2 glob you'll love it. What the hell is "salad rock," you may ask? Consult Orange County natives, King Shelter who coined the term to describe their one-of-a-kind sound, which combines elements of various genres to create something totally unique. Like Chop't for your music library, the "Gholy Host" group's irresistible tracks have been featured everywhere from MTV's Real World to Spotify's curated "New Noise" playlist. After what appeared to be a very lit performance at The Roxy in LA a few weeks ago, the four-piece embarked on North American tour which will take them through Chicago, Pittsburgh, Baltimore, and Nashville before wrapping on August 30 in Colorado Springs. They'll also be making a pitstop in NYC next week, where they'll be performing songs off their forthcoming sophomore EP, $hame. In-between their travels, the boys made a playlist for Bandsintown filled with all their go-to songs on the road. 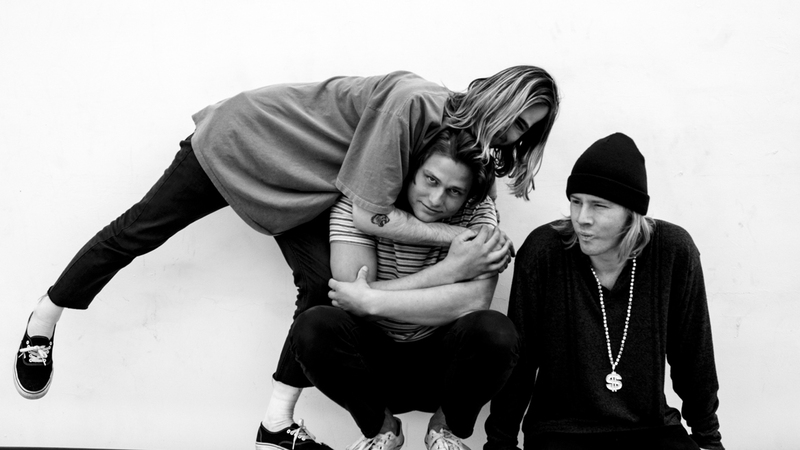 From Tyler, The Creator to Slowdive, check out what King Shelter is bumpin' to on tour and why, then make sure to Track them on Bandsintown to get notified when they'll be hitting a city near you! "I rock & roll, but indeed I do glow....and grow." "If u real, u already kno." "Would you fux me? I’d fux me." "Because MIKEY from The Frights gave MY Lollapalooza pass to his GIRLFRIEND." "Our favorite cover that YOU didn’t see 'cause YOU weren’t at my show." "This one’s for the sadbois. I like when the snare comes in."